A member of the armed forces was attacked by two other men in the London suburb of Woolwich yesterday. The attack was particularly brutal, it involved the use of knives and a machete, and the victim lost his life. The two attackers then hung around the scene until the Police arrived, made to attack them, and were shot and wounded as a result. That is what we know for certain. But this can never be enough for the 24-hour a day news cycle. And one of the attackers was heard to mention The Prophet. So into that news vacuum was poured a whole bucketload of speculation and hyperbole, worryingly kicked off by someone in Government who has so far managed to remain anonymous. Yes, once again we had to be scared of Muslims. Because, well, because, that’s why. 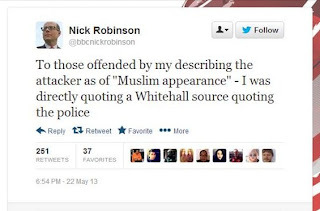 To his eternal shame, BBC Political Editor Nick Robinson reported – without filtering or questioning – a “Senior Whitehall Source” that told of one attacker being “of Muslim appearance”. What does a Muslim look like? Islam is not a religion of one particular ethnicity. That comment was loaded: whoever made it was cynically and deliberately trying to push a particular line, drive the news agenda one way. And it had the desired effect, with press and politicians scrambling to push their particular agenda, gain whatever advantage they could. Young Dave, after seeing his party register two opinion poll ratings well south of 30%, told that “We will never buckle to terror”. Christ on a bike, before long he’ll be brandishing a cigar and giving a reverse V-sign. The deluded fool thinks he’s channelling Winshton. Was this a terrorist attack? 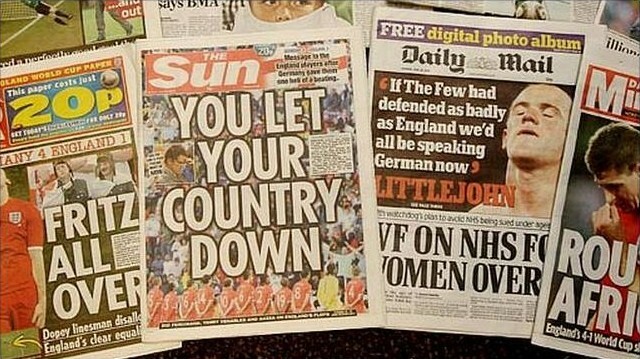 What the hell, there’s papers to sell. 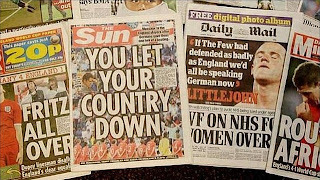 The Mail made the decision to go with “Islamic Fanatics”, which satisfies two objectives. First, the readers get frightened, and second, it encourages the morons of the EDL, who, right on cue, appeared in Woolwich last night for a bit of afters with the cops. The Mail can then tell its readers how ghastly the EDL are. The Sun, meanwhile, echoes the Mail (to no surprise at all): “Reports suggest the attackers were Islamic fanatics”. Yeah, your reports, for instance. Then comes a string of the usual language: “Shocking ... vile murder ... beyond belief ...horror ... twisted extremists” followed by the get-out clause “do not speak for millions of ordinary, hard working British Muslims”. So now, without knowing the identity of any of those involved, and on the basis of a few words uttered by a violent attention-seeker, we are expected to believe that the UK is somehow under attack, from someone or something, which is also asserted to feature people “of Muslim appearance”. Yes, never mind the crap economy and the useless politicians, and look over there instead. And off toddle the press sheep to do just that. Baaaaa! Baaaaa!! Muslims!!! [UPDATE 1555 hours: Nick Robinson has posted a detailed update on the background to his remark, which you can see HERE. He tells "That phrase 'Of Muslim Appearance' clearly offended some who demanded to know what it could possibly mean". Indeed. And, on reflection, he clearly regrets using that form of words: "I'm sorry for using a phrase that, on reflection, was both liable to be misinterpreted and to cause offence". He also notes the rabble-rousing of the EDL and overnight attacks on mosques. Normally I'd agree with but in this instance I'm not sure what they did wrong - the footage was in the public domain, the papers reported it as they, and many others, saw it. There were tens of witnesses and a fairly clear picture emerging of what had happened. The papers started off by calling it a serious incident in Woolwich, an 'assault' etc but once video footage and eyewitness accounts emerge, they are bound to report that. What else were they going to say? Did you even watch the video you idiot? The murderers were muslim by their own admission, not anyone elses. Comments are allowed even when the author is not merely anonymous, but has failed to read the post, or get the point of it. The question of whether or not the phrase “of Muslim appearance” should have been reported should be considered with the second question of whether it was true in the first place! The guy on the front page of todays Metro (50% of the attackers)is most definately not of Muslim APPEARANCE. If I had seen him before the attack and had been asked to guess religion I'd have gone for Christian, possibly one of the Gospel branches. But is this the deep conspriracy that Tim alludes to? Or is it just the great British public being absolutely hopeless at describing anything accurately in English and the media being bone idle? The word appearance means what they LOOK LIKE not what they say. What would have happened if they had fled the scene and the police had been forced to rely on witness statements? Now that does scare me!! And now I've seen the photo of the other 50% I'd say he doesn't appear Muslim either. So it seems if you want to rob a bank etc. the best disguise would be to shout something about allah and the public will see a different appearance and give the police incorrect descriptions.